Please be aware that our preferred format for the supply of text files is a print ready PDF file and all our estimates are based on this. We reserve the right to charge for any extra work caused by poorly constructed or problem files. Every effort will be made to check your job at each stage of production where possible, however no responsibility will be accepted for errors or omissions at the editing stage. 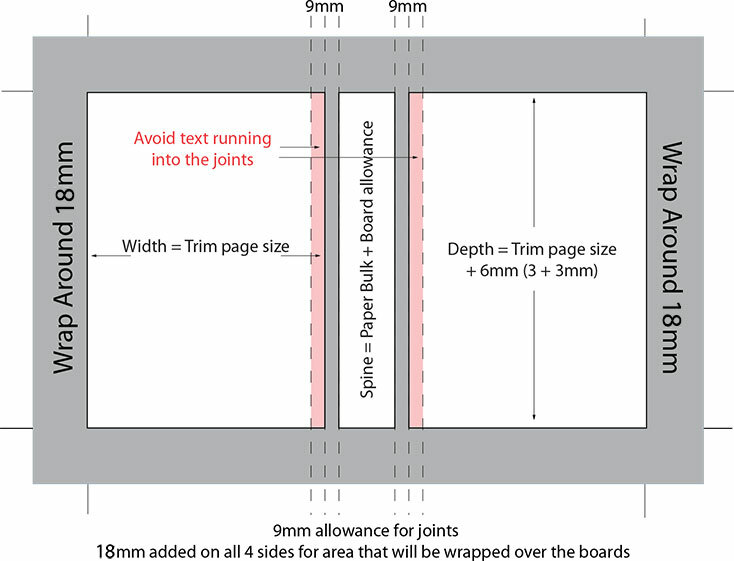 We suggest that you leave a minimum of 10mm clear space all around on your text pages but would recommend 15mm. When designing covers and jackets for book printing there are a number of points to take into consideration. Paperbacks have a card cover (we offer 230gsm and 300gsm 1 sided boards and 300 and 350gsm boards silk boards) which is then glued onto the spine of the book block. 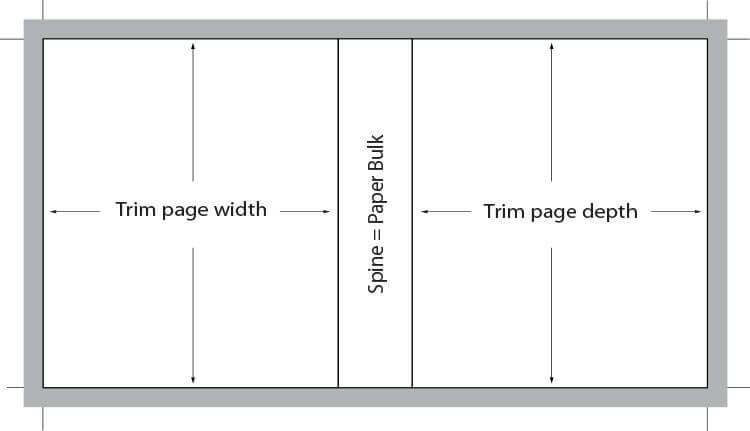 Printed Paper Cases (PPC’s) which consist of a paper cover (150gsm silk), wrapped around and glued to pieces of grey board to create a case which is bound to the book block. And finally the Book Jacket which is a paper cover (150gsm silk) wrapped around a plain cloth (usually Wibalin Buckram) covered case. plus any allowances for boards and bleeds. 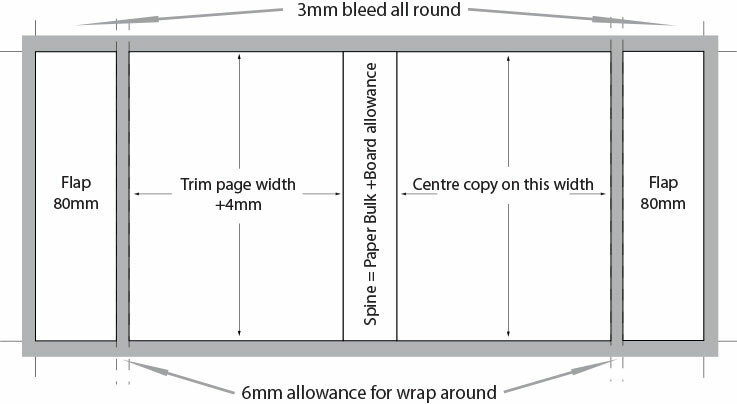 Below are example layouts showing allowances for bleeds (grey area around the edge), case sizes and wraparounds. A brass is a device made of zinc which is used to stamp foil lettering (usually gold or silver) on to the ‘cloth’ finish on a hardback on the spine, front or both. It is typically a copy of your spine/front text and usually includes the title, author’s name and sometimes a logo (please note any very small intricate detail is difficult to reproduce and should be avoided). Please calculate your spine width using our spine width calculator to ensure that the content fits the actual spine on the case. The areas that you require blocked will need to be set up as 100% black regardless of the colour on the printed dust jacket or what the final colour of the foil will be and should be supplied as black lettering on a white background as per the example below. Please supply this as a separate PDF file clearly labelled. A common problem when print ready text files are supplied is that the fonts are not embedded. If the fonts are not embedded then the fonts that you carefully chose may be substituted with fonts on our systems meaning that your text could rewrap resulting in all sorts of issues including extra or blank pages. 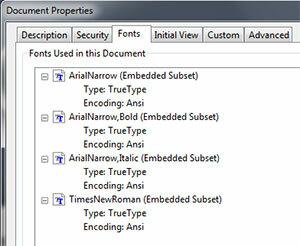 Did you know that there is a really easy way to check if your fonts are embedded? 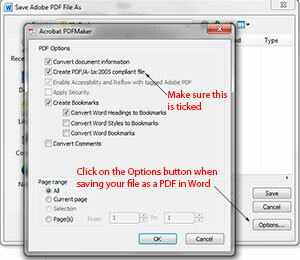 Open your PDF in Adobe Reader. Go the File Menu (top right) and choose Properties. In Properties go the Fonts tab. If your fonts are embedded then you should see the words (Embedded Subset) in brackets next to the name of the fonts that you have used. If you don’t see Embedded Subset then your fonts are not embedded. How can I embed fonts in Word? When you choose Save as Adobe PDF in Word then you need to make sure that Create PDF/A-1a:2005 compliant file is ticked and this will ensure that the fonts are embedded in your PDF. This is found by clicking on the Options button underneath Save and Cancel – see image below. Not sure which book size to choose? Click on the image below to download our handy UK Book Sizes Guide. 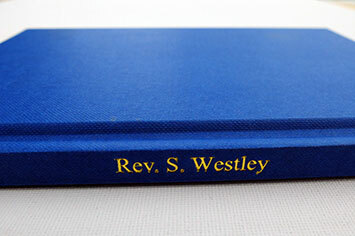 The above example shows gold foil blocking on the spine of a hardback covered in Wibalin Buckram Sapphire Blue cloth.